How Did Soldiers' Gear Change After 9/11? KitUp has an interesting take on 9/11: how the post-attack war on terror has affected US soldiers. On the left, a photo of a typical infantry man taken on September 10, 2001. 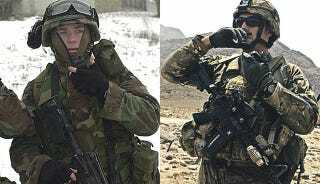 On the right, a soldier with today's standard equipment. The former is wearing a really heavy, oversized Kevlar helmet, a very basic and ineffective armor vest, Vietnam-era gear, a standard M4 gun—if he's lucky—with no aiming aids whatsoever. The latter is using a lightweight low-profile helmet, a rifle with laser and IR aims, high end mountaineering boots, and armor plates all around his light-weight fire resistant combat shirt—everything configurable depending on the needs of the mission.